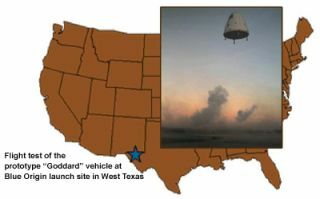 A flight test of the prototype "Goddard" vehicle at Blue Origin's launch site in West Texas. That secretive rocket work beingbankrolled by billionaire Jeff Bezos of Amazon.com fame has shed some new lighton its activities. Blue Origin is developing NewShepard, a rocket-propelledvehicle that takesoff and lands vertically and is designed to routinely fly multipleastronauts into suborbital space at competitive prices. ? Flight tests of the suborbital crafthave been staged at a privatelaunch site in Texas. Blue Origin is now noting that, inaddition to providing the public with opportunities to experience spaceflight,New Shepard will also provide frequent opportunities for researchers to flyexperiments into space and a microgravity environment. To help shape this activity, thegroup has announced that interested parties should contact Blue Origin'sindependent representative for research and education missions, Alan Stern, theformerNASA chief of space science. These research and educationmissions are dubbed REM, oriented toward microgravity and space scienceinvestigations. This activity would be in additionto, not in place of, Blue Origin's long-standing plans for human-carryingcommercial flights. The first opportunities for autonomous or remotelycontrolled experiments on unpiloted flights could be as early as 2011 and thefirst ones requiring accompanying research astronauts would be available asearly as 2012. In a mission overview, Blue Origin explains that the NewShepard vehicle will consist of a pressurized Crew Capsule (CC) carryingexperiments and astronauts atop a Propulsion Module (PM). Flights will take place from BlueOrigin's own launch site, which is already operating in West Texas. New Shepardwill take-off vertically and accelerate for approximately two and a halfminutes before shutting off its rocket engines and coasting into space. The vehicle will carry rocket motorsenabling the Crew Capsule to escape from the PM in the event of a seriousanomaly during launch. In space, the Crew Capsule will separate from the PM andthe two will reenter and land separately for re-use. The Crew Capsule will land softlyunder a parachute at the launch site. Astronauts and experiments will experienceno more than a 6g acceleration and a 1.5g lateral acceleration during a typicalflight. High-quality microgravity environments will be achieved for durationsof three or more minutes, depending on the mission trajectory. Blue Origin is soliciting input frominvestigators to help design research astronaut and experiment accommodations.Researchers will have the opportunity to provide their own racks to mount intothe vehicle (subject to a safety review), or use standard racks and services tomount their experiments. Flight experiments may beautonomous, remotely operated, or operated manually by an accompanyingresearcher provided by the customer or by Blue Origin. As for a timeline, Blue Origin notesthat flight testing of prototype New Shepard vehicles began in 2006. The group expectsthe first opportunities for experiments requiring an accompanying researcherastronaut to be available in 2012. Flight opportunities in 2011 may beavailable for autonomous or remotely-controlled experiments on an unpiloted flighttest. As for the kinds of experiments thatcould be flown, Blue Origin's website lists remote sensing, such as atmosphericscience and Earth observations, sampling of the atmosphere and magnetosphericmeasurements. In-cabin science investigations are listed too, includingphysiology, gravitational biology or microgravity physics research. Still under study is possiblelaunching of deployable payloads from the New Shepard. Blue Origin's interest in suborbitalscience, like other rocket firms, is being stoked by NASA creating a programoffice to explore this arena at the space agency's Ames Research Center. That office is investigating the useof emerging commercial suborbital vehicles for scientific research, including,but not limited to, flights to space of researchers to allow for human-tendedexperiments. By the way, a Human-TendedSuborbital Science Workshop is on tap next week at the Westin San Francisco Market Street. That Dec. 15 workshop is being held in conjunction with theAmerican Geophysical Union Fall Meeting and is sponsored by the UniversitiesSpace Research Association.